michael wanguhu is a young kenyan filmmaker. 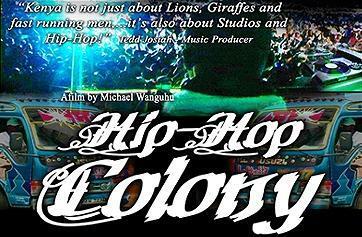 his new film, hip-hop colony, is a vivid portrayal of hip-hop's presence in contemporary kenya. although explicitly mindful of the ways that hip-hop can be seen as yet another colonial force, the film shows the many ways that kenyan artists make hip-hop their own, re-localizing its forms and practices for their own purposes and in their own language(s). as much as their voices sometimes ring with the familiar grain of a 50 or j-hova (or, yes, a buju), their self-consciousness about such appropriations and about their projections of kenyanness--often via sheng and swahili and invocations of mau mau, though also in more subtle ways--demonstrates with clarity that there is little hegemon/homogen-ization at play here. this is a more complex story, and wanguhu's filmmaking does it justice, offering up interviews, freestyle ciphers, and local performances as evidence. hip-hop colony thus flips the contemporary colonial/globalization narrative the same way kenyan rappers flip the scripts of african-american (and afro-jamaican) music. writing their own chapter in the story of hip-hop (and dancehall), they show it to be a global form with routes as wide as its roots are deep. one of the film's most interesting aspects (at least for me) is its almost entirely unremarked documentation of the influence of dancehall reggae in kenya's hip-hop scene. although serving more as a subtext and rarely remarked on, it was evident that that kenyan hip-hop artists, as with their brethren worldwide, embrace the sounds of jamaica along with the sounds of the U.S., mixing dancehall riddims and hip-hop beats, patois and slang, all rather seamlessly. what the film evokes perhaps most powerfully is how fluidly, how fluently kenyan artists version these foreign but familiar materials. the audience at the screening i attended last week let out its largest collective laugh when one young MC rapped something like, "got a girlfriend, half-japanese, half-puerto-rican / she probably cookin' up some rice as i'm speaking." it was clear from moments like these that hip-hop has been able to communicate, in a rather intimate and resonant way, the experiences and aspirations and imaginations of its practitioners (stereotypes included) to audiences far, far away. and though one sad converse of such moments is the realization of how rare it is for americans to resonate with the experiences and perspectives of, say, kenyan youth, a film like hip-hop colony proves that such an identification is not at all far-fetched. one corrective to that asymmetry would be for films like this one to be shown far and wide. currently, hip-hop colony is touring the US, making stops at colleges and arthouses. there is hope for a wider release, including a DVD (which would be great, especially for those of us who like to set-up screenings of our own at colleges, etc.). try to catch it when it comes through your area (see the schedule on the site), check out the trailer here, and keep your eyes peeled (and make your voice heard) for a wider release. 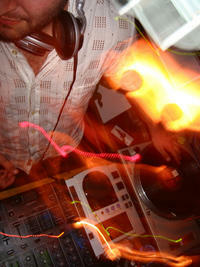 n-ron and leftenant are mixtape-making edutainers. their latest, a thunder sound, weaves together various strands of the afrofuturistdiaspora, linking dancehall, hip-hop, baile funk, grime, leftfield electro, and field recordings in a dense web of sound (see tracklist). underpinned by a number of strong remixes, including a wicked fix of lady sovereign's "random," the mix offers some surprises amidst the twin pleasures of recognition and jutaposition. the degree to which their selections overlap with my own listening preferences from the last few years is kind of shocking (and great fun), but then again, the mix found me for a reason. still, any mix that brings together ethnomusicologists, bjork, dancehall versions of cyndi lauper, and antipop's beans is no average effort. a thunder sound not only unites these seemingly disparate sources, it does so impeccably, with nary a transition to be questioned. i myself was won over in the first few seconds by their decision to begin with a recording that is a longtime favorite of mine: postal workers cancelling stamps at the university of ghana post-office (as recorded by ethnomusicologist jim koetting)--perhaps the most joyful sounds of "work" that you'll ever hear. from there, n-ron and leftenant do all the work, piling on the styles and pulling them apart again, revealing sonic and social links in the process. these are imaginary links, yes, but real, too--and they are made real by their materiality as sonic force, as things felt and heard and vibrated to. n-ron and leftenant thus edify as they engage; their musical articulations are pointed and political. this is some serious culture mashing (despite the occasional reference to punaany and guntalk, which, after all, have their place in all of this). a thunder sound is the sound of an electrified urban globality, an intensely networked place negotiating its connectedness, a cosmopolitan cosmos in which we remember with vigilance what's underneath even the happiest seeming beats. for all its thunder, it is a sound like lightning, cracking open possibilities, connecting here and there, then and now, high and low, fast and slow in one electric instant. mulatu astatqe is a master musician from ethiopia who put down roots in boston back in the 1950s when he came to the city as a student at the school that would one day become berklee. 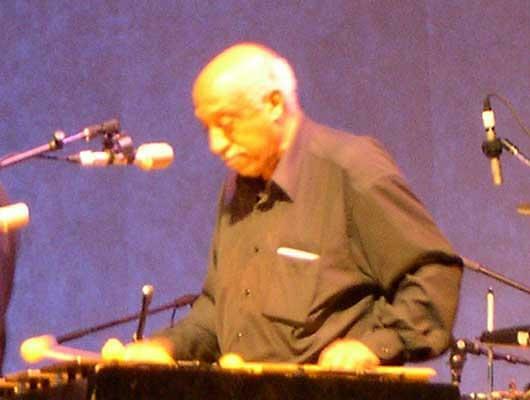 after this period of study, he returned to ethiopia and made a major mark on its music scene, essentially inventing what came to be called ethio jazz. recently, mulatu has garnered some (long overdue) attention here in the states due to the inclusion of his music on the soundtrack to jim jarmusch's broken flowers. their show at the lizard lounge on friday night was entrancing. forming an inward looking circle in order to fit into a small space and keep the lines of communication open, the large group--comprising several saxophones, a trumpet, trombone, two drummers, a bassist, and mulatu on vibes--played with verve and sensitivity. although i was unfamiliar with the compositions, their employment of ethiopian tunes and scales served to distinguish the music from your typical big-band jazz offerings (not that the either/orchestra have ever sounded typical). the solos were superb, adventurous, and tasteful and the ensemble passages provided thrilling moments of counterpoint riffs, collective heads, and tight endings. best of all was the joy of recognition one felt among the crowd, a substantial percentage of whom came from the local ethiopian/eritrean community, who roared with appreciation upon hearing a song or a gesture from "home." mulatu was received warmly throughout the night, and his solos on the vibes gave palpable, shimmering shape to the fusions in formation.